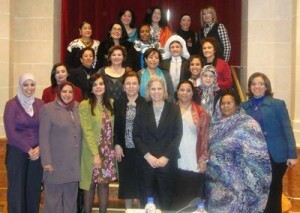 AMMAN ––– Despite being the main victims in regional armed conflicts, women are still excluded from playing a role in conflict resolution and peace negotiations, women’s rights leaders said on Tuesday. During the closing meeting of the Arab Women’s Intellectual Organisation, discussions focused on the impact of armed conflicts on women in Iraq, Sudan, Yemen, Lebanon and Palestine. “Politics is seen as an exclusively male domain in Iraq… Iraqi women are facing tremendous challenges to take part in conflict resolution at decision-making levels,” Iraqi activist Salma Jabou said, adding that there are currently about one million widows in Iraq. Amal Khreisha, an activist from Palestine, noted that the consequences of armed conflicts have a more obvious impact on women because of their “weak” social status.